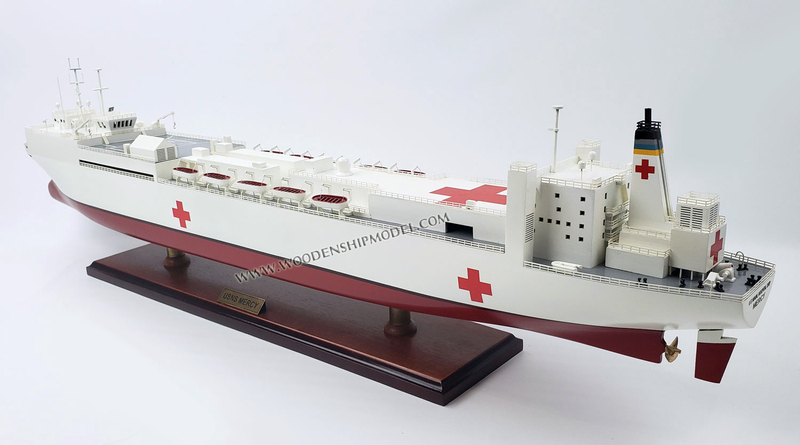 The USNS Mercy (T-AH-19) is the lead ship of her class of hospital ships in the United States Navy. Her sister ship is the USNS Comfort (T-AH-20). She was named for the virtue of compassion. 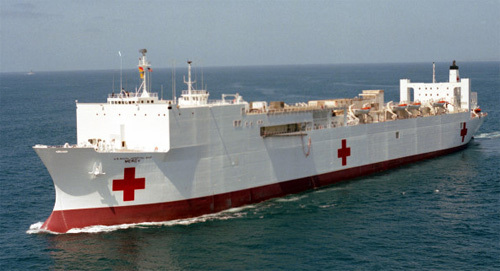 In accordance with the Geneva Conventions, USNS Mercy and her crew do not carry any offensive weapons, though defensive weapons are available. Firing on the Mercy would be considered a war crime. Mercy was built as an oil tanker, SS Worth, by National Steel and Shipbuilding Company, San Diego, in 1976. 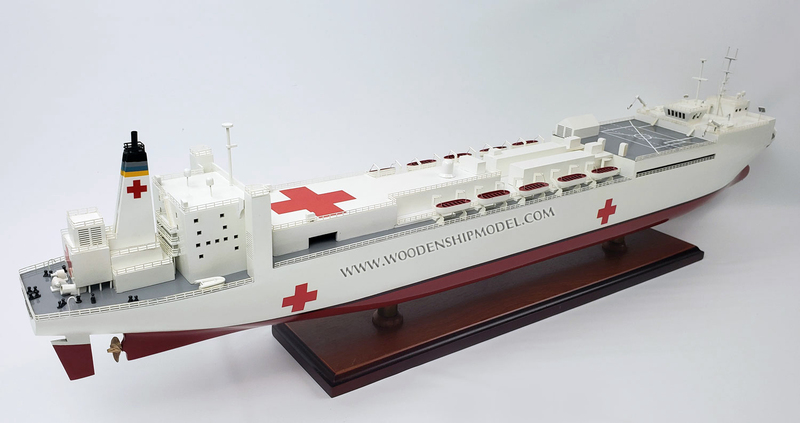 Starting in July 1984, she was renamed and converted to a hospital ship by the same company. 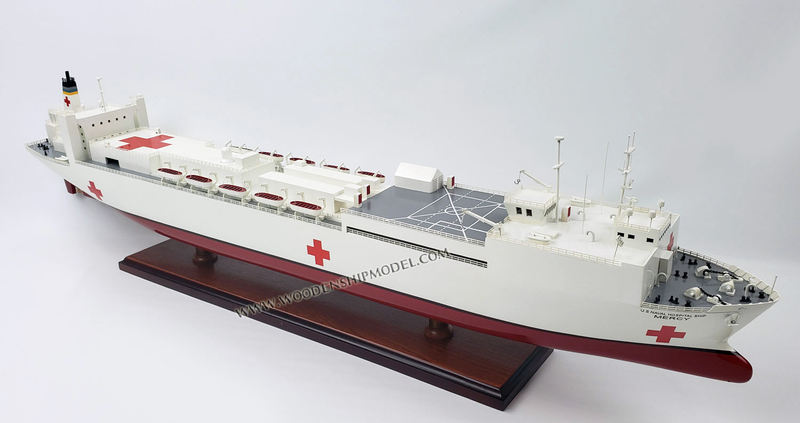 Launched on 20 July 1985, USNS Mercy was commissioned on 8 November 1986. She has a raised forecastle, a transom stern, a bulbous bow, an extended deckhouse with a forward bridge, and a helicopter-landing deck with a flight control facility. 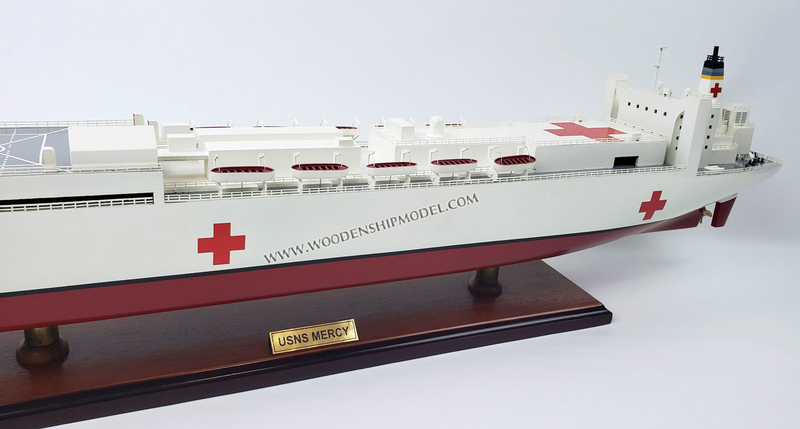 The Mercy class hospital ships are the third largest ships in the U.S. Navy Fleet by length, surpassed only by the nuclear-powered Ford-class and Nimitz-class supercarriers. Her primary mission is to provide rapid, flexible, and mobile acute medical and surgical services to support Marine Corps Air/Ground Task Forces deployed ashore, Army and Air Force units deployed ashore, and naval amphibious task forces and battle forces afloat. 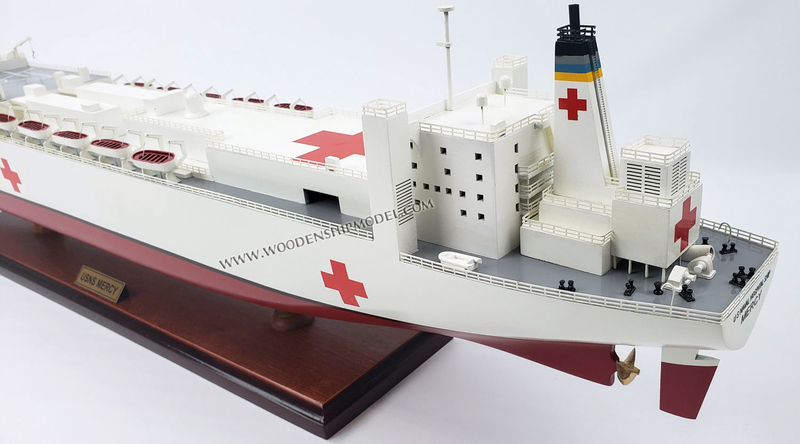 Secondarily, she provides mobile surgical hospital service for use by appropriate US Government agencies in disaster or humanitarian relief or limited humanitarian care incident to these missions or peacetime military operations. 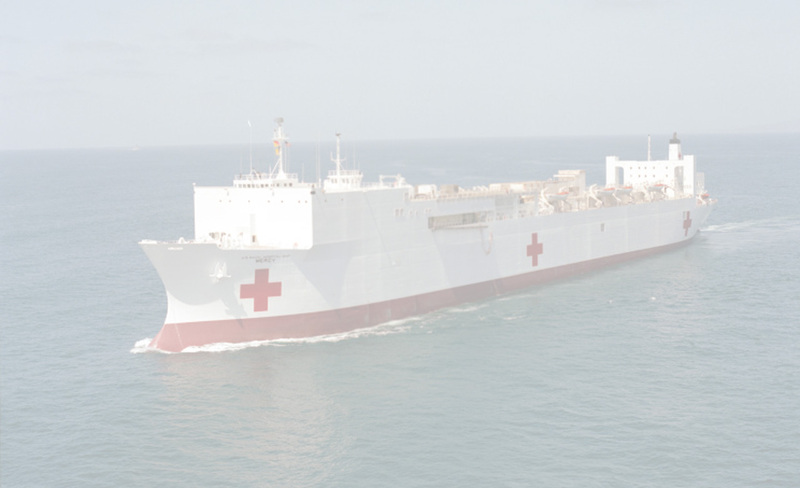 USNS Mercy, homeported in San Diego, is normally in reduced operating status. Her crew remains a part of the staff of Naval Medical Center San Diego until ordered to sea, at which time they have five days to fully activate the ship to a NATO Role III Medical Treatment Facility, the highest only to shore based fixed facilities outside of the theater of operations. Like most "USNS" Ships, Mariners from the US Navy's Military Sealift Command are responsible for navigation, propulsion, and most deck duties on board. 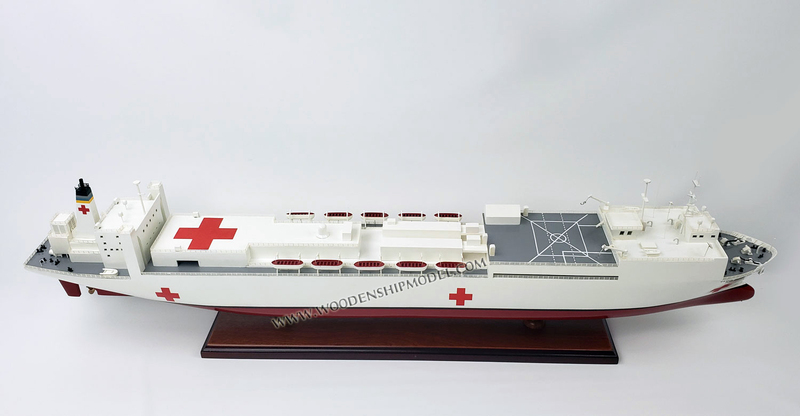 However, the "Medical Treatment Facility", or hospital on the ship, is commanded by a Captain of the Navy Medical Corps or Navy Nurse Corps.